Despite its importance, there is no universally accepted definition of excellent teaching, yet excellent teaching is expected across educational settings. Uncovering the structures of communication around excellent teaching can provide teacher training programs with perspectives for programming and curriculum design. 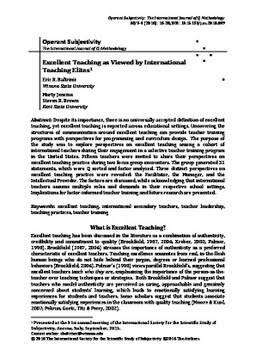 The purpose of the study was to explore perspectives on excellent teaching among a cohort of international teachers during their engagement in a selective teacher training program in the United States. Fifteen teachers were invited to share their perspectives on excellent teaching practice during two focus group encounters. The group generated 31 statements, which were Q sorted and factor analyzed. Three distinct perspectives on excellent teaching practice were revealed: the Facilitator, the Manager, and the Intellectual Provider. The factors are discussed, while acknowledging that international teachers assume multiple roles and demands in their respective school settings. Implications for factor-informed teacher training and future research are presented.